DR Congo refugees (file photo). Lusaka — CASH-strapped Zambia is appealing for international assistance to provide for over 10 000 Congolese refugees settled in the Southern African country. President Edgar Lungu made the request after visiting the Kenani Transit Centre in the northern Zambia to assess the situation of over 6 000 refugees fleeing the violence and insecurity from the neighbouring Democratic Republic of Congo (DRC) since end of August. Lungu expressed concern that the situation at the congested Kenani Transit Centre in Nchelenge District of Luapula Province. 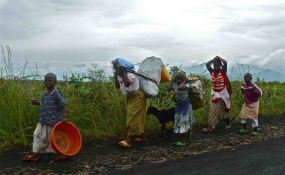 It is deteriorating as more Congolese refugees, especially those currently staying in border villages, continued arriving at the transit centre. The centre is currently receiving an average 150 new arrivals per day. "I am appealing to all donors, international community and humanitarian actors to do more and take action to prevent the situation in Nchelenge District turning into a humanitarian crisis," Lungu said. "The needs of refugees and host communities are many. UNHCR and other partners can only continue to provide assistance with the support of the international community." Lungu toured the transit centre, during which he met government and humanitarian workers as well as refugees. He witnessed various services and support provided to the refugees. In order to decongest Kenani Transit Centre, the government has offered 5 000 hectares of land to develop a new refugee settlement in Nchelenge District. Pierrine Aylara, UNHCR representative in Zambia, echoed Lungu's call for more resources to support the emergency response. She said there would be need to set up basic facilities such as shelter, access roads, schools and clinics. "We also appeal to the government to improve the main access road to the new refugee settlement as well as engage the Rural Electrification Authority to extend the area to the national electricity network," Aylara said.